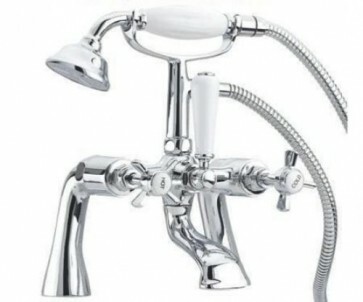 HERE WE HAVE A SUPERB CHROME BATH MIXER TAP SET COMPLETE WITH HAND SHOWER BASE MOUNTED (CAN ALSO BE WALL MOUNTED!) WITH HOT AND COLD TAPS AND SWITCH TO PUSH THE WATER EITHER ON TO THE HAND SHOWER OR THE BOTTOM TAP NICE NEW ITEM FREE POSTAGE! QUICK DELIVERY BRAND NEW IN THE BOX SAVE A FORTUNE ON THE RETAIL PRICE! SAME ITEM YOU WILL SEE IN LARGE RETAIL SHOWROOMS FOR MUCH MORE! LIMITED STOCKS!